The most important centre of Venice was the area around the Ducal Palace, which, apart from the palace of the Doge, comprised of the church of San Marco, the Campanile which was used to mark the time of day and night and as beacon for the ships, and the piazza (Lane 1973, 12). This central piazza along with a smaller one located next to the palace, were the location of many festivities of the city, while the area around them became gradually the neighbourhood of many nobles who wished to have their houses close to the Doge’s palace and to the administrative centre of the city (Lane 1973, 12). 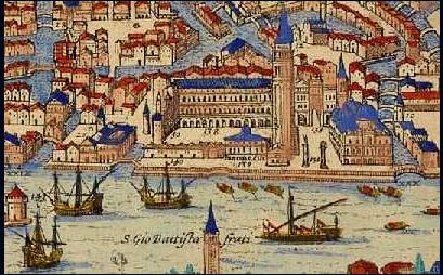 In front of the Ducal palace, there was the Molo and a basin, the Bacino San Marco, which was one of the busiest centres in the city and extended to the island of San Giorgio Maggiore (Lane 1973, 13). 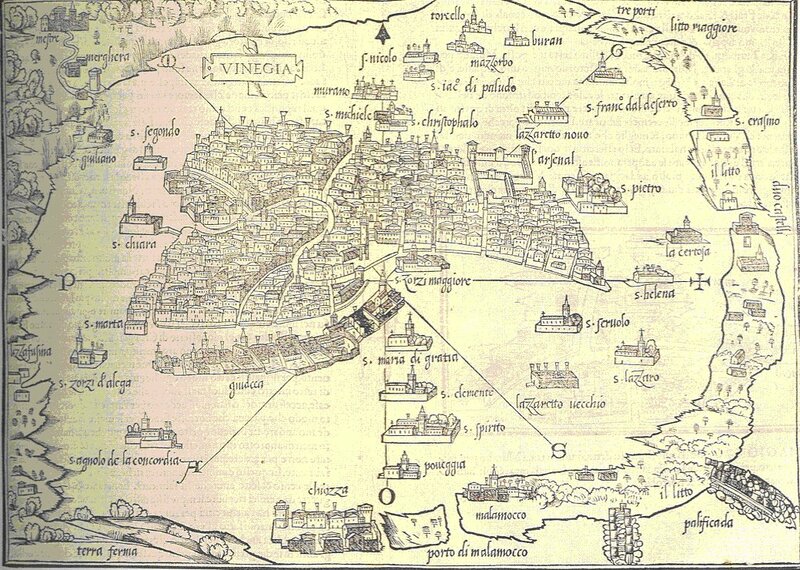 Although the area of the Ducal palace was the administration centre of Venice, the ecclesiastic one was on the island of San Pietro where the cathedral of the city, the church of San Pietro di Castello, located in the eastern part of the city close to the Arsenal (Hibbert 1988, 337). From the layout and the spatial organisation of the city it becomes apparent that there was sufficient importance attached to the parishes, as the hearts of their local communities, and to a sense of neighbourhood. All these neighbourhoods were connected with a series of main arteries, such as the Grand Canale (Lane 1973, 12). The Grand Canale was the main artery, which ran through the city, more than 3 km long, and varied in its width between 30 to 70 m., it is spanned by three bridges: the Rialto, the Academia bridge and the station bridge (Hibbert 1988, 354). Along the Canale, apart from many palazzos and houses, there were many industries, warehouses and other buildings (Lane 1973, 14). Originally the fish market, the butchers and other shops were located along the Canale, some close to the Rialto but they were eventually relocated so that these areas could be used by bankers, and by people who dealt with finance and with negotiations of cargo (Lane 1973, 14). The Rialto had always been the commercial centre of Venice, located in an area on the left bank of the Canale, and there was also increased traffic because this was the meeting point of boats and people coming form the mainland and from the sea (Lane 1973, 14; Hibbert 1988, 336). Many of the industries were gradually pushed away from the centre of the city and thus glass-makers were moved to the island of Murano, the cloth-makers were gathered towards the western end of the Grand Canale and of course the biggest industry of Venice, ship-making was moved to the eastern end of the city (Lane 1973, 14). Originally shipyards extended in an area from the Bacino San Marco to the Lido, but from the mid 14th c they were moved to Lido; this was the location of the Venetian arsenal was also the Arsenal both a shipyard and centre for arms manufacturing, although there were also other shipyards outside the city (Lane 1973, 14-15).